Look at the tips of the two toes closest. See the tips? The last joint is displaced--folded under. 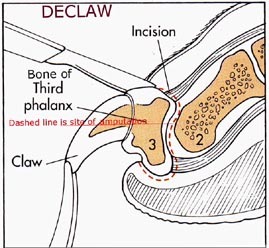 Now compare that tip to the third toe (phalanx) which is in the right location. This is painful, and inhibits walking. Think of what it would feel like if the last joint of your toe was folded under. Hi, Great website! I want to share a declaw horror story. I own a pet supply retail store in Florida and offer rescue & adoption assistance to nonprofit groups and good Samaritans in the community. Last week, I assisted with a cat who was found lying listlessly on the side of a busy highway. Upon spotting her, a good Samaritan pulled over assuming the cat had been hit by a car. The poor cat just barely lifted her head to greet her rescuer. Meowing piteously and seeming unable to walk, she was obviously in great distress. When her rescuer picked her up, he noticed that her legs, chest and face were covered in blood. He rushed her to a nearby shelter and, after careful examination; the shelter veterinarian announced that the cat was in perfect health expect that she had recently been declawed. We’ll never know the whole story but it seems this poor mutilated creature was so emotionally & physically wounded that she attempted to run away from the trauma and ended up so disoriented and anguished that she just collapsed. The good news is that she was treated for shock and a life-threatening infection and is now on her way to recovery and eventual adoption. 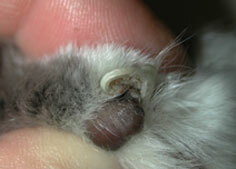 here might help save other cats from the horrors of this heartless surgery. Thank you for all you do! I adopted a young DSH male who needed a home. He was super affectionate and very friendly. He followed me around the house, slept with me, sat in my lap while I watched TV and wanted to spend all his time with me. Well, I declawed him when he was altered at about 6 or 7 months. He never got over it. He seems to have some sort of nerve problem in one of his front paws in one or more toes. I can tell he hurts. His whole personality has changed! He no longer follows me around and only sleeps with me on a limited basis. He went from being a wonderful pet to simply "being here" without much interaction anymore and all in the past year since his declawing. It was almost instant change! I feel so guilty for having done this to him. except where they are necessary for veterinary medical reasons. 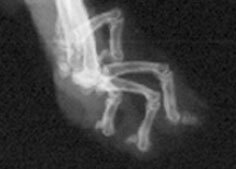 Another site with an account of the pain, includes x-ray of the damage the operation can cause at http://www.pawproject.com/html/gallery.asp. 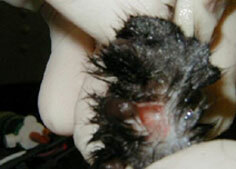 The site supports legislation to ban the practice of declawing. http://www.littlebigcat.com/index.php?action=home has a library of article many by veterinarians on cats. Most of us have de-sexed animals. When a woman has her ovaries removed or tied, post-operative opiates are administered. Don’t animals feel pain!!! And just as people hunt animals, they murder and go to war. I understand the cause for Mark Twains’ The Damn Human Race.